Devoted Quilter: Friendship Galaxy Pattern Release! I am so happy to be able to release my Friendship Galaxy pattern today! The pattern includes instructions to make a 45" square baby quilt, an 11 1/2" x 29 1/2" skinny mini quilt, a 29 1/2" square mini quilt and a 65 1/2" x 74 1/2" throw size quilt. The pattern also includes colouring pages to help you decide where to place the fabrics in your quilt. 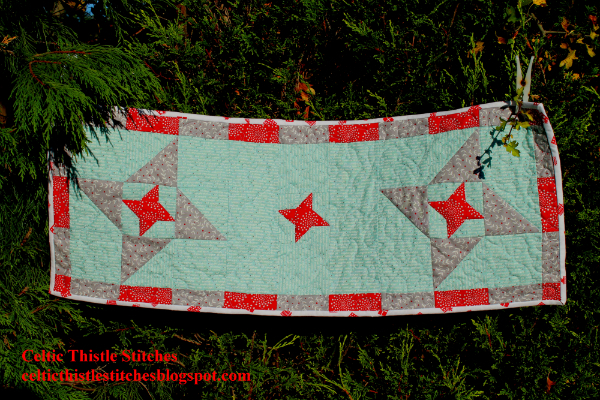 You can read more about the baby quilt I made for little Judah in this finish post. I also made a skinny mini version, though that one is still waiting to be quilted. I had three fantastic testers volunteer to make their own Friendship Galaxy quilts, and I love all of their versions! 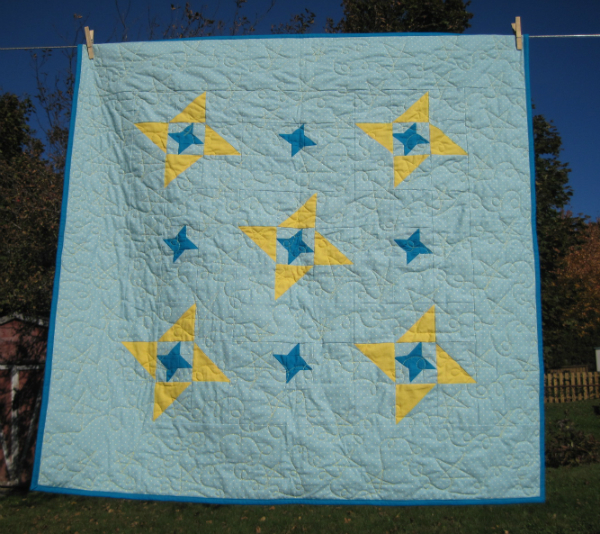 Anja, of Anja Quilts, used the 29 1/2" mini layout, but added a wide border to make it a baby quilt. You can read more about her quilt here. Fiona, of Celtic Thistle Stitches, chose to make a Christmas version of the skinny mini layout. And Laura, @sliceofpilife on Instagram, made this striking two tone version of the baby quilt size. It's always so much fun to see what other people make using my patterns! Thank you so much to Anja, Fiona and Laura! I really appreciate you taking the time to test the pattern and give me feedback. The Friendship Galaxy pattern is now available in my Payhip and Etsy shops. 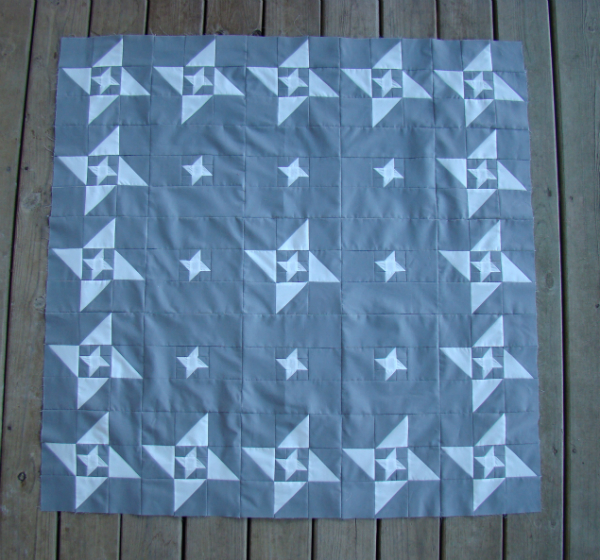 Because some of the pieces are quite small (1 1/2" squares and HSTs), this pattern is more suited to an intermediate or confident beginner quilter. 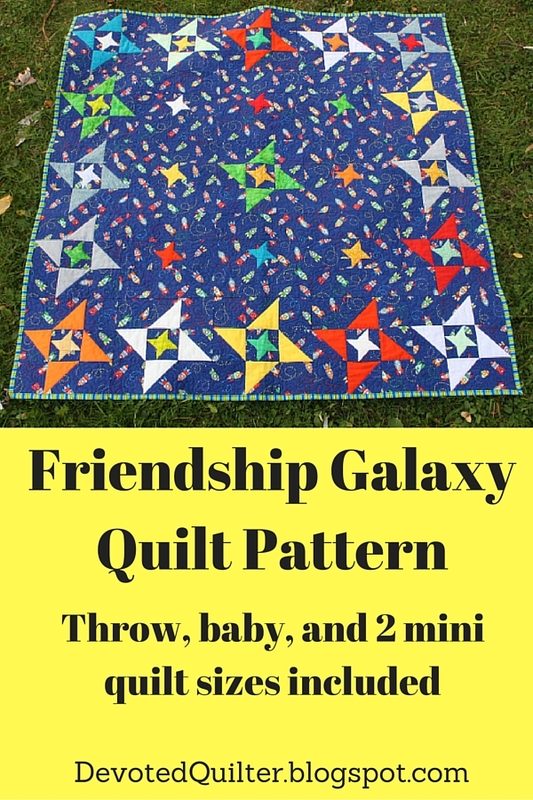 If you make a quilt using the Friendship Galaxy pattern, I'd love to see it! Tag me on Instagram (@devotedquilter) or email me a picture or a link to a blog post. You can find a quick link to my email at the top right of my sidebar. Congratulations on a new pattern release! It is always such a treat to see how others interpret a pattern. One of my favorite things is seeing different versions of a quilt pattern. Your testers made some awesome quilts! Congratulations on your new pattern release Leanne, it was a joy to test! I am sure that it will be a popular pattern. Thanks for the opportunity. I enjoyed this pattern, and I have plans to make another baby quilt. Very fun, and congratulations! Patterns are a lot of work. Wow - that gray study really is striking in this design! Oh how gorgeous, they're all so pretty and with fireworks popping off left right and centre here for bonfire night, very apt!! Congrats on getting the pattern all finished up! I loved seeing the tester quilts too. Oh this is fun. I just saw the tablerunner on Celtic Thistle Stitches blog! What a great pattern!